Oddly enough, as Swedish crime fiction went and conquered the world, I had remained blissfully oblivious – although, visiting the Bengaluru bookshops, I did notice Henning Mankell, and Mankell again, on the shelves. It struck me how, internationally speaking, Swedish culture forty years ago was synonymous with the cinema of Ingmar Bergman, twenty years ago with pop music like ABBA, and today Stieg Larsson’s Millennium Trilogy tops bestseller lists everywhere while newcomer Johan Theorin was short-listed for the British Crime Writers’ Association’s Dagger Award 2009 for Echoes from the Dead. This year, to gain further enlightenment, I dressed up in a raincoat, packed a rickety umbrella, and flew to Gothenburg, where the Swedish Book Fair at the end of September pulled in approximately 98,000 literature fans. The frenzy peaked at signings featuring virtually all the famous crime writers – except Larsson who died before his 2005 debut. The biggest splash was made by Lars Kepler whose The Hypnotist was sold to 26 countries even before it hit the home market in July. The real sensation was that Kepler doesn’t exist! The book, it turned out, is a brainchild of highbrow writer couple Alexander and Alexandra Ahndoril, who penned it as timepass and appeared genuinely surprised at its mass-market appeal – though now, according to their publisher, several sequels are planned. Amazed at the overheated scene I pondered how unusual all this is, considering that Sweden isn’t exactly 1930s Chicago. Traditionally, Swedish crime fiction has tended to follow foreign models – the first detective novels were inspired by none other than Sherlock Holmes. One can’t even claim that Sweden saw a ‘Golden Age’, like British and American crime fiction did in the first half of the 20th century. In fact, pulp crime books were ‘literary weed’ that progressive writers wanted to have uprooted. Then came the ‘police procedurals’, pioneered in the US by Lawrence Treat, popularized globally by Ed McBain with the 87th Precinct series – a genre in which Swedish husband-wife writer team, Sjöwall-Wahlöö, struck gold in 1965. They created a cop collective around the character Martin Beck who spent an equal amount of time solving crimes and solving problems at home. Markedly different from the detective as a loner with a high-calibre handgun or silver-haired granny cracking whodunit puzzles set up by sporting murderers, a Sjöwall-Wahlöö cop is never witty, is downed by the flu rather than by a gangster, and eats fried herring from roadside stalls. Their last book, The Terrorists, came in 1975 (the year of Per Wahlöö’s demise) and over time the ten novels were filmed repeatedly – nearly as many different actors have portrayed Martin Beck as there are James Bonds on celluloid, including, believe it or not, Walter Matthau in an adaptation of The Laughing Policeman set in San Francisco. Then fifteen years went by, some decent crime novels were published, but nothing happened… until Mankell came along. At this year’s ‘book mess’, as the Swedish Book Fair is jokingly referred to, Mankell towered like the Himalayas above the rest, with a fresh but – alas! – final instalment of his near-epic narrative about the memorable antihero Kurt Wallander. Unlike earlier cop stories, the ‘Wallander’ books aren’t set in Stockholm. Although it was assumed that only a big city has crime worth writing about, Mankell portrayed Ystad instead, where he’d been living off and on. As I pass the unremarkable town on my tour I barely register its existence before the train leaves the tiny centre behind; with a population of 25,000 it can be compared to a big village in India – though if one were to trust Mankell’s books, it has the greatest number of psychopaths per capita. 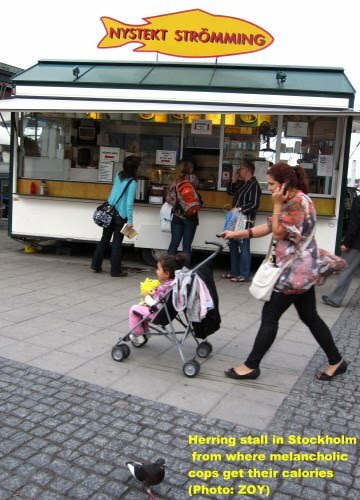 Interestingly, Ystad is nowadays a tourist destination for Germans. (German bookshops are reported to have special shelves for the popular genre ‘Schweden-Krimis’.) Visitors can sign up for the elaborate Wallander Tour (available in English too) to locations such as the pizzeria where Wallander gets his calories and the coffee shop in which you can try his favourite herring sandwiches. But tourists don’t flock just to Ystad, for taking their cue from Mankell, writers have described crime in smaller and smaller towns to the extent that there’s hardly a precinct without its own fictional netherworld – pick any backwater town, Linköping or Luleå, Sandhamn or Strömstad, and it’ll give Chicago a race for its money. Readers of Åsa Larsson – whose Sun Storm is set north of the Arctic Circle – use that as an excuse for a trip to the tundra; if you liked The Princess of Burundi by Kjell Eriksson you’d put Uppsala on a tour itinerary; Camilla Läckberg fans invade rural Fjällbacka (population 930 and the setting for eight crime novels). Surveying the map, the island of Gotland (a province no bigger than Goa, with a population twenty-five times smaller) is overflowing with fictional crime, what with some three writers spreading serial death there. 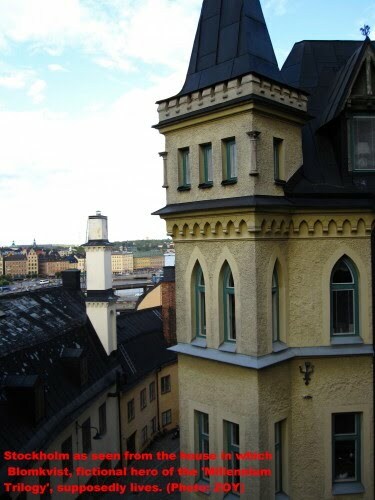 In 2007 the Swedish Tourist Association (www.svenskaturistforeningen.se) published a guidebook to ‘criminal Sweden’, highlighting, for example, that in Stockholm tourists can stay in old Långholmen Prison, today converted into a hostel. The book promptly won an award from the Swedish Academy of Crime Fiction which hands out a ‘criminal version’ of the Nobel Prize. Among past winners are Mankell and, posthumously, Stieg Larsson. Last week in Stockholm as I checked out locations from the Millennium Trilogy, a trickle of tourists were braving the rains. The municipality organizes a ‘Millennium Walk’ which has takers from as far away as France and Italy. Significantly, Larsson avoided the overused ‘police procedural’ formula, and created an odd team of a grumpy journalist, Blomkvist, and the multi-pierced hacker punk, Salander. Making big news is the forthcoming biography, STIEG, scheduled for a 2010 launch, which will reveal the fascinating story of Larsson himself – who in many ways resembles the novels’ Blomkvist. The biographer is Jan-Erik Pettersson, legendary ex-publisher who worked with Mankell and discovered the trendsetting horror-crime-writer John Ajvide Lindqvist (whose Let the Right One in will be a major Hollywood picture soon). Huh? Do you mean that Salander is a version of the mischievous Pippi Longstocking of my childhood? Aha, that’s why the ‘Millennium Trilogy’ is popular – Stieg simply wrote fairytales for grown-ups. The current trend suggests that around 100 new crime novels are going to be launched before this year is over, out of which an astonishing 25 percent may be debuts. Busy hacks are reportedly tying rulers to their wrists, so that their hands don’t go limp while they churn out pulp during fifteen-hour shifts, and sales are counted in tens or even hundreds of thousands. For instance, Stieg Larsson’s final novel, The Girl Who Kicked the Hornets ’ Nest, has just been published in Spain where it is reported to have sold 200,000 copies in a single day! So tiny Sweden, with a population much smaller than, say, Delhi’s, has an unprecedented number of crime writers and, in fact, many of the best are women: keep an eye out for veteran Kerstin Ekman whose Blackwater has been translated even into Hindi. Among the latest ‘police procedurals’, newcomer Carin Gerhardsen’s nerve-wreckers are must-reads. The boom is clearly not over yet – many more red herrings are going to be served to hungry readers. Swedish crime writers to keep an eye out for and that may turn up in bookshops in India: René Vázquez Diaz, Kerstin Ekman, Kjell Eriksson, Inger Frimansson, Carin Gerhardsen, Lars Kepler, Åsa Larsson, John Ajvide Lindqvist, Håkan Nesser, Johan Theorin, Helene Tursten, plus the new writer team called Roslund & Hellström. Further reading: The king of Swedish crime writing is somewhat critical of his younger colleagues: Interview with Henning Mankell, "Crime fiction is the mirror"